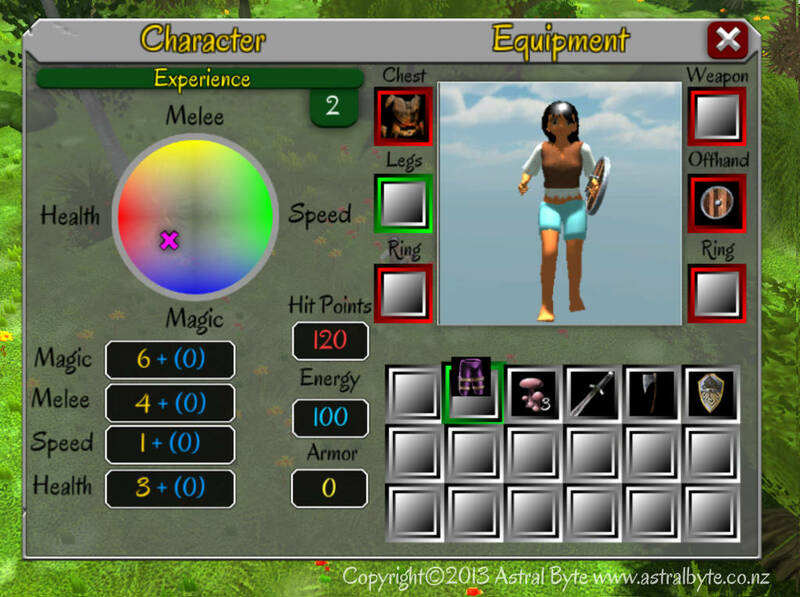 Character and inventory windows | Astral Byte Ltd.
With the basic quests and player damage finished, I thought it best to add some character to the game. And by character, I mean the player’s character windows. I wanted to do something that was different then every other hack-and-slash game out there. But how can you spice up the traditional layout? And then it hit me, why not add a visual method that shows the player where their points have been spent. A way to quickly show where the character is and how far it may be from other types. I started off with what I think is a unique idea and made a quick prototype design layout. As players add points into Magic, for example, it would move the magenta diamond down toward the magic area. If they put points into speed and magic, then they would get a fast powerful wizard. However, the character would also be weak (low health) and no do any melee damage. Working with it game, I changed the diamond into a circle as it seemed to flow better. In the attribute field, the yellow numbers are the base value. The blue “+ (0)” is additional bonus levels granted by any items. Now that I had the base screen I needed the level up function. 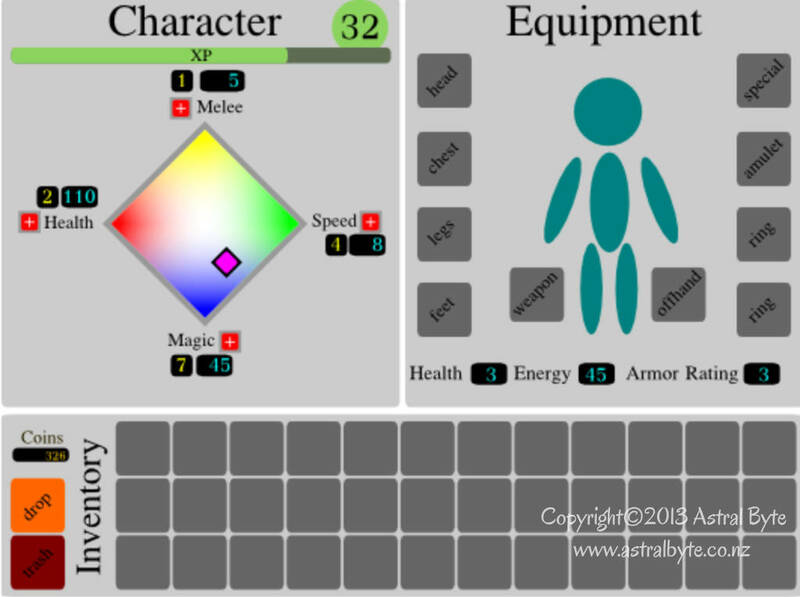 I added some nice big buttons next to the stats with a total available level at the top. 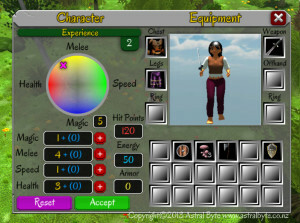 The player can add points and see their stats change. If they are unhappy with it reset restores all spent points for the current process. 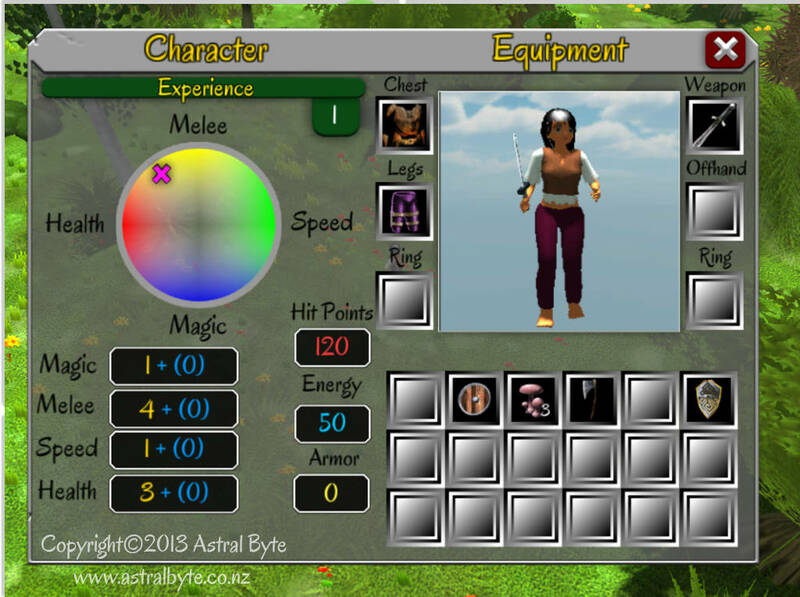 Finally improved the inventory / backpack slot system. 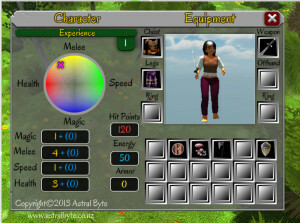 Once a item is picked up with the mouse, all the equipment slots are highlighted to show where players may place the item. This gives quick feedback for new players who may not know where they can place items. 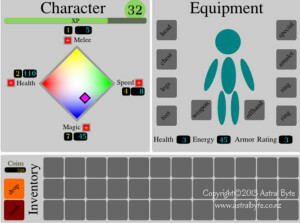 Items can also be right-clicked to auto-equip into the correct slot. 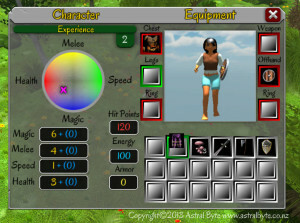 The player can see and rotate their character and have immediate visual feedback on their new loot. I still have a lots of work to do to improve the look and icons. And most of this is early “programmer graphics” that I plan to refine in the future.